We are located on the West Slope in Colorado, in the beautiful Gunnison Valley near Crested Butte. While we specialize in designing and installing robust alternative energy systems for remote locations, we work on many varied projects from off-grid summer cabins to on-grid city dwellings. We pride ourselves in quality workmanship, and carry NABCEP PV Installer Certification. Using a whole-system approach, we do more than just sell solar energy systems - we work with you to provide the best possible solutions for your energy needs. We are SunPower Authorized Dealers! We are pleased to offer SunPower's reliable, efficient, high power PV systems in addition to our other offerings. Contact us for more details. Our varied clients have included the US EPA, US Forest Service, Outward Bound Wilderness, the Crested Butte Nordic Center, contractors, ranchers, and homeowners. We are located on the West Slope in Colorado, at the head of the beautiful Gunnison Valley in Crested Butte. 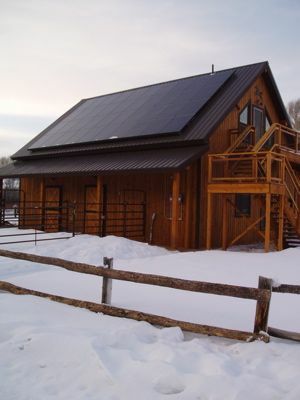 While we specialize in designing and installing robust alternative energy systems for remote locations, we work on many varied projects from off-grid summer cabins to on-grid city dwellings. We pride ourselves in quality work, and carry NABCEP PV Installer Certification. Our varied clients include the US EPA, US Forest Service, Outward Bound Wilderness, the Crested Butte Nordic Center, contractors, ranchers, and homeowners.